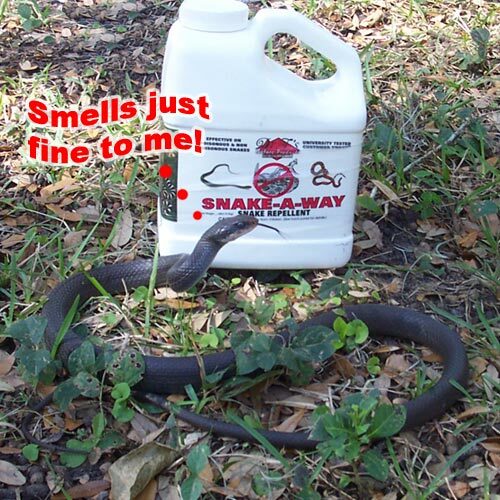 Snake repellant - Does It Work? People will always try to sell you products, and magic cure-alls. Some products work, and some don't. In the field of wildlife control, you'll often find more bogus products than effective ones. Snakes are reptiles, not insects. The internet is full of snake deterrent products, but virtually none of them work. Some of these products include cinnamon or spicy powders, which is a nice idea in theory, but it isn't effective. Other products are simply made of napthalene - moth balls - which some companies sell as an end-all be-all in wildlife repellant. Sorry, it simply doesn't work. I've seen people dump a whole 5 lb. box of mothballs under a deck where snakes are living, and they don't care in the slightest. They keep using the area. People also claim that sulphur will keep snakes away. That is ridiculous. Hey, I know, why don't you just sprinkle lemon juice on the ground - that is sure to keep snakes at bay. Devices such as ultrasonic sound emitters that make a high-pitched noise are completely useless. I've been to so many properties over the years in which people have spent time and money on silly gimmicks like these, and then they hire a real wildlife control operator, and the problem is correctly taken care of. If you have a snake problem and you wish to get rid of them, they should be physically trapped and removed from the habitat. Either that, or physical barriers, such as fences (that go at least a foot underground) should be put in place as a means of snake prevention, to keep them from entering ground level areas.